The µVision Debugger provides dialogs for most peripherals to verify the initialization value. 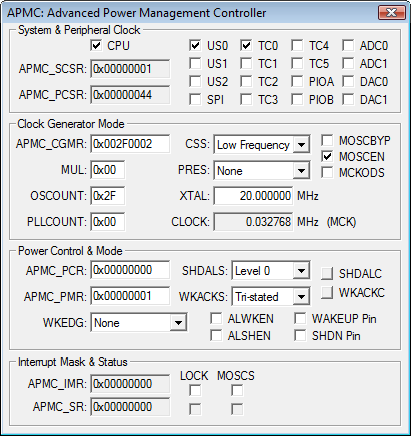 For example, with the dialog Peripheral — Advanced Power Management Controller you review the microcontroller configuration of the Atmel AT91M55800A device. Check the microcontroller and peripheral initialization values first with the Simulator. Wrong settings might not work with the target debugger.